San Francisco Bay Area design and branding firm, Project6 Design, launches website for the National Girls Institute, a non-profit dedicated to promoting understanding of girls’ issues and girls in the juvenile justice system. Project6 took our vision and turned it into a clean and functional design. We are very pleased with the website! —Dr. Lawanda Ravoira, Director of the National Girls Institute. 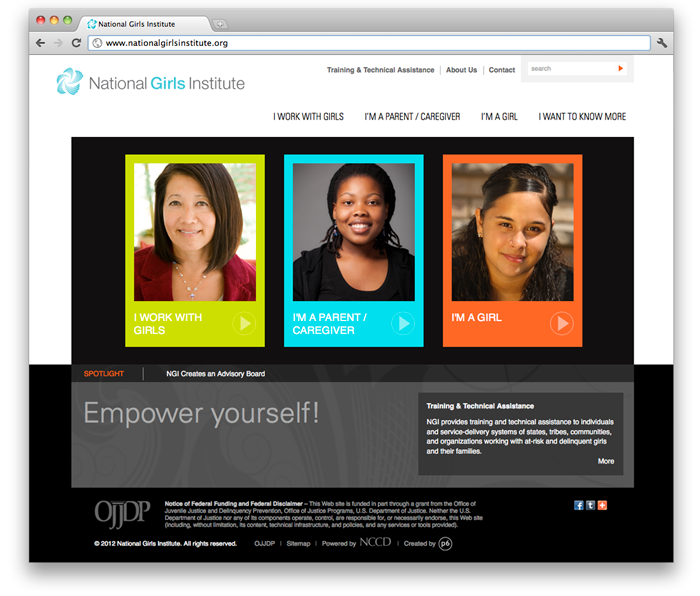 Project6 Design, an award-winning San Francisco Bay Area design and branding agency, proudly launches the website for the National Girls Institute (NGI), a non-profit organization whose mission is to advance understanding of girls’ issues and improve program and system responses to girls in the juvenile justice system. NGI is a federally-funded partnership between the National Council on Crime and Delinquency (NCCD) and the Office of Juvenile Justice and Delinquency Prevention (OJJDP). Project6 worked closely with both organizations on the user interface and design, ensuring a smooth process throughout. Additionally, Project6 is working with NCCD on the web design and build of several other inspiring websites, due to launch in upcoming months. The NGI website is built with WordPress, an open-source content management system (CMS). WordPress is one of the most popular content management systems in use on the Internet, and it allows the NGI Team to add, edit or delete web site content quickly and easily. The National Girls Institute (NGI) is a federally-funded partnership between the National Council on Crime and Delinquency (NCCD) and the Office of Juvenile Justice and Delinquency Prevention (OJJDP). NGI is a research-based training and resource clearinghouse designed to advance understanding of girls’ issues and improve program and system responses to girls in the juvenile justice system. For more information about NGI, visit http://www.nationalgirlsinstitute.org. NCCD promotes just and equitable social systems for individuals, families, and communities through research, public policy, and practice. For more information about NCCD, visit http://www.nccd-crc.org. Project6 Design is a San Francisco Bay Area (Berkeley, CA) based graphic design agency that specializes in strategic brand, print and web design and build services. The Project6 creative process elicits your true brand character, engages your target market, and has measurable results. Our design firm's services include branding identity, logo design, HTML emails, web design and build, and print design. Project6 Design works with clients in a variety of industries including: Non-Profit, Retail, Solar Power, High-Tech, Education and more. High-profile clients include UCSF, UC Berkeley, Lawrence Berkeley National Laboratory, and The Gladstone Institutes. Other clients include the Gap, Old Navy, eBay, United Way, and Serena Software. For more information, call 510.540.8005 ext.100, email: info[at]project6[dot]com or visit http://www.project6.com.